Mason Coulibaly’s disallowed goal in the USA/Slovenia game will most likely be the worst call of the 2010 World Cup. To date, it is heads and shoulders above the rest. But that didn’t stop Stephane Lannoy from attempting to top his counterpart. 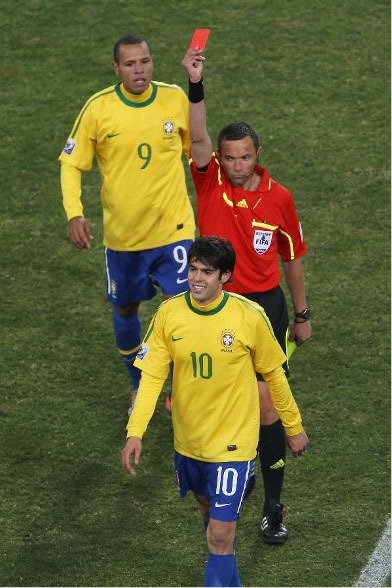 Kaka is sent of by French referee Stephane Lannoy after his second yellow card. Drawn on a dive by an Ivory Coast player. I only saw bits and pieces of the Brazil/Ivory Coast match this afternoon but, it seems as if I missed quite a bit. In the short period that I viewed, I didn’t see any goals or fouls but, I did see the highlights later. From what I could tell, this guy was awful. Now, his failure to call a blatant handball on Luis Fabiano’s second goal (which was nothing short of masterful) was a massive oversight. Later, Lannoy missed numerous dangerous challenges from Ivory Coast players and sent off Kaka after an awful, awful dive. By now I am accustomed to seeing soccer players take bad dives, the slo-mo replays on ESPN magnify the problem even more. I thought one of the most embarrassing dives in this World Cup was made by Luis Suarez of Uruguay in their match with South Africa. After he bled, due to a forearm to the face, he jumped and pirouetted for the remainder of the game. One particularly ugly dive led to a Uruguayan penalty kick. While the game was never in doubt, it was still sad to see such poor sportsmanship. But back to the task at hand, Lannoy made a handful of poor calls that cast an even darker shadow on the officiating at this World Cup. While, he didn’t cost Ivory Coast the game, he could cost them a berth in the second round. Especially if the absence of Kaka aids in a Brazilian loss or draw at the hands of the Portuguese. Next Article Pebble Beach 2010: The Open nobody won.